Make sure to rinse the quinoa thoroughly before adding it to the cooking water. Cook quinoa according to package (usually 1:2 ratio of quinoa to water). I like to use half vegetable broth as the liquid to add some flavor to the quinoa. Place quinoa, water, about 1-teaspoon sea salt and a drizzle of olive oil in the water and bring to a boil. Once boiling, cover and turn heat to low. When quinoa is done cooking and all water is absorbed (about 15-20 minutes), let it sit, covered, for another 5 minutes. While quinoa is cooking, sauté onions in a little olive oil over a low heat, until sweet and tender. Place them into a mixing bowl. Heat about 1 tablespoon olive oil over a low heat with minced garlic. When oil is warm, add chopped spinach and sauté until tender but still bright green (a minute or two). When done, place in mixing bowl along with sautéed onions. Prepare mushrooms by removing the stem and gills (a spoon works great at removing the gills, which are the dark brown lining on the underside of the cap. Use your hands to lightly coat both caps in olive oil, salt and pepper. Then, place on a baking tray, top facing down, along with ¼ cup vegetable broth (helps to keep the mushrooms moist while baking). Once quinoa is done cooking and has sat for at least 5 minutes, mix in with broccoli and onions, along with ¼ cup of grated Parmesan, a sprinkle of salt and pepper, and a drizzle of olive oil. Use a spoon to place the mix evenly into each mushroom cap. Then, use the remaining of the Parmesan cheese to top it off. Place in the oven and bake at 350 for about 10 – 15 minutes, until cheese is melted and everything is heated through. 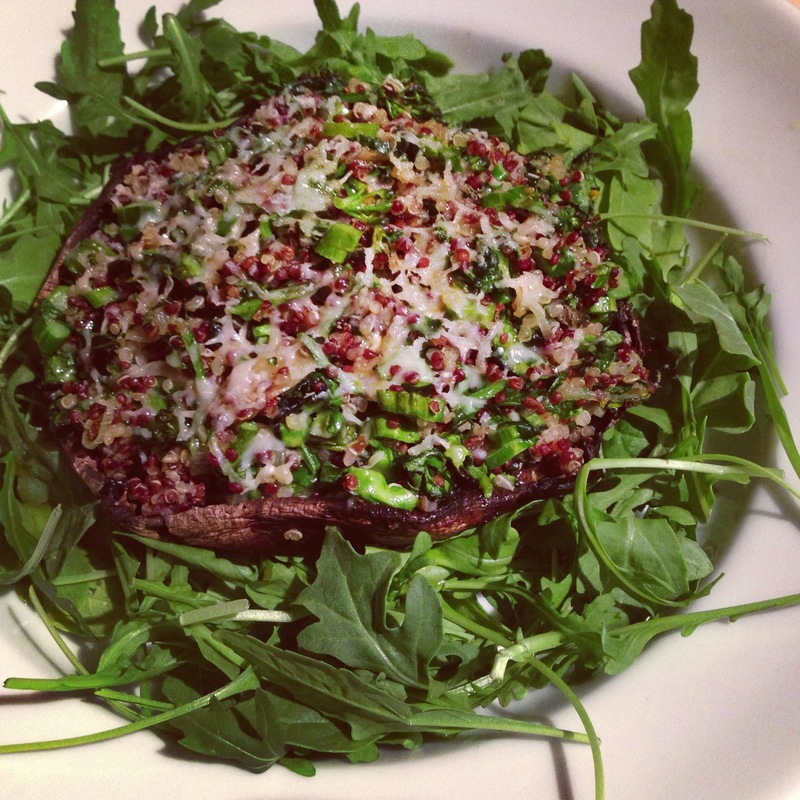 When finished, place the mushroom cap over a bed of arugula or enjoy as is.